Polymers are very long molecules and the main component in many common plastic materials. On this page the molecular structure, production-manufacture, uses and recycling of the polymers poly(ethene), poly(propene), poly(chloroethene)/PVC and polystyrene are described. Problems with waste plastics and methods of recycling of plastics are discussed. These revision notes on polymers & plastics should prove useful for the new AQA, Edexcel and OCR GCSE (9–1) chemistry science courses. These revision notes on the synthesis of polymer plastics and their properties and uses should prove useful for the NEW AQA GCSE chemistry, Edexcel GCSE chemistry & OCR GCSE chemistry (Gateway & 21st Century) GCSE (9–1), (9-5) & (5-1) science courses. Polymers are long chain molecule formed from lots of repeating units joined together by strong covalent bonds. This page describes the formation of big polymer molecules called polyalkenes from small molecules called alkenes and relates their structure to their physical properties and uses. Comparison note: The intermolecular forces between polymer molecules are bigger than those between small molecules like water and great enough to ensure plastic polymers like poly(ethene) and PVC are solid at room temperature. The greater the intermolecular forces the greater the energy needed to overcome them and melt a material. These intermolecular forces are much weaker than ionic or covalent bonds so the melting points of polymers are much less than those of giant covalent structures like diamond or silica or ionic compounds like sodium chloride. The diagram below shows the general equation for the formation of a plastic polymer from alkenes. There are many different alkenes, so there are many different polymers with a range of physical properties eg strength. When catalysed and heated under pressure, unsaturated alkenes link together when 'half' of the double bond opens. The spare bond on each carbon atom of the double bond are used to join up the molecules. To form an addition polymer, the monomer molecule must have a double bond. The general equation for polyalkene formation is shown in the diagram above and it is the presence of the carbon = carbon (C=C) double bond in the alkene molecule that enables the molecules to join together to form a long chain. .... to give a long polymer chain molecules, hundreds-thousands of carbon atoms long! ... and the whole chain of atoms is held together by strong carbon-carbon covalent bonds. This process is called addition polymerisation, the monomer molecules all add together, with no other product formed other than the long polymer molecule. Full equations showing all the atoms involved are given in the next section 7b. The attractive forces between the molecules, the so-called 'intermolecular forces' or 'intermolecular bonding' are much weaker than the chemical bonds between the atoms, but they are most important in determining the properties of the polymer AND as you will read on later, they can be changed to change the physical properties of a polymer. Think of the process as springing open half of the C=C double covalent bond of an alkene and using the 'spare bonds' to link across from one alkene molecule to another. This can only happen if the hydrocarbon molecule is unsaturated, like alkenes (with a C=C double bond). You cannot polymerise saturated hydrocarbon molecules like alkanes (all C-C single bonds). Most polymers (plastics) are made from alkene compounds containing the -C=C- bond by addition polymerisation. The general reaction is small monomer molecule ==> long polymer molecule as the small molecules link together to form a long chain with no other molecules formed. The original small molecule is called the monomer and the long molecule is called the polymer, which is the sort of molecule most plastics consist of. The polymer is now a saturated molecule but has the same C:H ratio as the original alkene. Several examples are shown and their formation and structure described below, namely for poly(ethene), poly(propene), poly(chloroethene) PVC, polystyrene. Their properties and uses of these thermoplastic materials are also described and explained. The polymers described on this page are typical addition polymers (formed by simple addition of monomer molecules), just like polythene and polystyrene etc. The starting small molecule is called the monomer. In addition polymerisation there is no other product except the polymer itself because all the molecules are used up to form longer and longer polymer chains (very long molecules) with the same repeating unit based on the original monomer (see the first example below). AND they are all examples of thermoplastic polymers (thermoplastics), that is, the polymer can be heated and softened, reshaped and cooled to keep their new moulded shape. The monomers a polymer is made from determine the type and strength of intermolecular bonds between the polymer chains, hence they determine the physical properties of the polymer e.g. strength - rigidity, softening - melting point. The equation for the formation of the polymer poly(ethene) from the monomer ethene is shown below. It is often commercially called 'polythene' or written incorrectly as polyethene or polyethylene. The equation for the polymerisation of ethene is shown in several ways below. To indicate the repeating nature of the molecule, bond dashes go through the brackets giving the 'shorthand' or 'abbreviated' representation of the structure of poly(thene) -(-CH2-CH2-)- where n is the very large number, and can represent hundreds or even thousands of repeating units in one polymer molecule, in this case poly(ethene). Above is show the displayed formula style equation for poly(ethene) formation, or a simpler molecular formula style equation below. The repeating unit shown in brackets for poly(ethene) is (CH2-CH2) and n is a very large number, and can represent hundreds or thousands of repeating units in one molecule. -(-CH2-CH2-)n- is a sensible way of writing these huge molecules! A 'picture' of a section of a very long chain poly(ethene) polymer molecule, essentially consisting of hundreds or thousands of -CH2-CH2- ethene units all joined together. Above is a 'space-filling' model 'ball and below a 'stick' type of model. Although the poly(ethene) molecules look straight, in reality, the long molecule will be all twisted, jumbled and tangled up as in the thermoplastic diagram on the right. A pile of spaghetti isn't a bad analogy here! These are typical thermosoftening polymers consisting of individual, tangled polymer chains and melt relatively easily when they are heated. Using these models' to explain the general physical properties of a thermoplastic polymer. The bonds in these polymer molecules are covalent and very strong, but the intermolecular forces are much less strong BUT greater than in small molecules like water or pentane so polymers are solid at room temperature. Generally speaking, the bigger the molecule the bigger the intermolecular forces, the higher the melting point, because more energy is needed to weaken the intermolecular forces. The higher the temperature, the greater the kinetic energy of the particles to overcome the molecular attractive forces. Because polymer molecules are very big, compared to small covalent molecules like water or ethanol, the intermolecular forces (intermolecular bonding) are much greater and so polymers-plastics like poly(ethene), PVC poly(chloroethene), polystyrene or poly(propene) are all solid at room temperature. BUT, the intermolecular forces (electrical attractive forces) between the polymer molecules are still quite weak compared to the strong covalent bonds (C-C) holding the chain of atoms together. In general, intermolecular bonding forces are much weaker than covalent or ionic bonds. Because this 'intermolecular bonding' is weaker, when heated, these 'plastic' materials will soften/melt quite easily (hence easily remoulded) at relatively low temperatures (e.g. for poly(ethene) 110-150oC), without breaking any covalent bonds in polymer molecule, which is why they are called 'thermoplastic' and have relatively low softening/melting points. Even when 'cold' and apparently solid, the plastic is easily distorted (easily bent when stressed) because the polymer chains can slide over each other i.e. the external physical force applied on bending overcomes the intermolecular forces between the polymer molecules. It is important to understand these ideas when comparing and explaining the properties of 'thermoplastics' and 'thermosets'. Despite their relative weakness, on controlled heating, until they are quite soft (but NOT molten), they are readily extrusion moulded or drawn out into useful shapes (even fibres) which retain their new formation on cooling. Also, the flexibility and sometimes stretchability is actually very useful - think of plastic 'polythene' bags and PVC coated electrical cables. What reaction conditions are used in the manufacture of polymers? Does changing the reaction conditions have any effect on the physical properties of the polymer? Can we make different forms of the same polymer for different uses? The properties of polymers - plastics depend on what monomers they are made from and the reaction conditions under which they are made. For example, low density polyethene (LD, LDP) and high density poly(ethene) (HD, DDP) are produced from ethene using different catalysts and different reaction conditions. All polymers have their own characteristic physical properties depending on their specific molecular structure. The strength of the intermolecular forces (intermolecular bonding) between the polymer molecules is crucial to how strong, rigid, flexible etc. the manufacture plastic material is. If the molecules can be made more 'lined up way' and more 'densely' packed, the intermolecular forces (intermolecular bonding) increases, the physical properties change e.g. the polymer density and rigidity increases, so it is stronger and less flexible. It is possible to achieve variations in the physical properties of plastics like 'polythene' by varying the manufacturing conditions to give subtle differences in the molecular structure and composition of the polymer-plastic produced..
Two different types of poly(ethene) and their molecular structure and physical properties are described with reference to their different uses. Polymers like poly(ethene) are usually produced under conditions of relatively high pressure, elevated temperature and a catalyst. However, by changing and selecting the reaction conditions e.g. pressure, temperature or catalyst, you can make subtle changes to the physical properties of the polymer obtained from the polymerisation process e.g. changing temperature, pressure or catalyst. This allows the manufacture of a weaker more flexible lower density poly(ethene) referred to as LDPE (LD poly(ethene), and a stronger less flexible higher density form of poly(ethene), HDPE (high density poly(ethene). LDPE In the original high pressure process developed in the 1930s, poly(ethene) was made at a moderate temperature of 80oC to 300oC and a very high pressure of 1000 atm to 3000 atm. pressure (1 atm = normal atmospheric pressure at sea level), the poly(ethene) product has a lower density and very flexible. Small controlled traces of oxygen (< 10 ppm) are used to initiate the polymerisation process. The polymer chains are quite jumbled up and the polymer chains also have many branches (NOT cross-links), and the intermolecular forces between molecules are weaker, so the plastic is less strong and less rigid, more flexible than HDPE poly(ethene). This lower density weaker form of poly(ethene) melts at around 115oC, but softens well before that temperature, so don't have very hot drinks from an LDPE polythene cup! LDPE poly(ethene) density ranges from 0.91 - 0.94 g/cm3. LDPE poly(ethene) has about half the strength of HDPE poly(ethene). This 'low density poly(ethene)' is known by the acronym LDPE and is used for plastic bags, plastic bottles, cling film wrap, laminating paper, car covers, squeezy bottles, liners for tanks and ponds, moisture barriers in construction. Low density poly(ethene) is not very heat resistant and softens easily if heated, so it can't be used for any application where temperatures well above room temperature will be encountered! HDPE However in the 1950s, it became possible to make poly(ethene) in a low pressure process at around a lower temperature, maybe as low as 50oC, and using a much lower pressure of a 2 atm to 80 atm., AND a different catalyst, the polymer product is more dense and less flexible. Here the polymer chains are much more aligned with each other, maximising the intermolecular forces/bonding between the molecules, so the plastic is stronger and more rigid and less flexible than LDPE poly(ethene). The polymer molecules are longer with far fewer branches in the chains and this allows the poly(ethene) molecules to get closer together (just compare the two diagrams above-right). This is a more heat resistant higher density stronger form of poly(ethene) melting at around 135oC and can withstand contact with hot water without distortion! HDPE poly(ethene) density ranges from 0.95 - 0.97 g/cm3. HDPE has about double the strength of LDPE poly(ethene). This 'high density poly(ethene)' is known by the acronym HDPE and is used for freezer bags, water pipes (a bit flexible but quite strong), or more rigid uses like drainpipes and water tanks, plastic milk bottles, strong plastic crates, wire and cable insulation, extrusion coating. the more jumbled or 'spread out', the polymer chains are, the weaker the intermolecular forces/bonding, the polymer material is less dense and weaker e.g. more flexible. First and foremost poly(ethene) from ethene is a cheap, if not very strong, useful plastic. Poly(ethene) on heating is readily moulded into any shape e.g. 'plastic' bottles. This is because poly(ethene) is an example of a thermoplastic - it can be heated to soften it, reshape it e.g. in an injection mould system, and on cooling retains its new shape - bottle, bowl, toy etc. Lower density poly(ethene) is lighter and 'stretchy' and used for plastic bags, plastic piping, laminating paper etc. A general important point to make here is that the use of a polymer doesn't just depend on its chemical composition and molecular structure, but mainly on its physical properties (which of course are derived from the polymers structure). These differences become accentuated when comparing thermosoftening plastics and thermosetting plastics which also includes a discussion on modifying polymers to change their properties, hence varying their uses. What happens if you strongly heat plastics like poly(ethene)? You can thermally degrade poly(ethene) in a sort of 'cracking experiment' illustrated below. When you strongly heat a plastic-polymer you break some of the carbon-carbon bonds (C-C) in the polymer chains to produce much smaller and volatile molecules. Some of the molecules will be liquid or gaseous alkenes which you can collect as shown above. You can test the organic liquid in the bottle or the gases collected in the inverted test tube initially filled with water. The collected hydrocarbons should include alkenes (including the original ethene) which you can test for with bromine water - which turns from orange to colourless (see chemistry of alkenes for details of alkene test). (old or commercial names: polypropylene, polyprene and polypropene). The polymerisation of the monomer propene and the molecular structure of the polymer formed, poly(propene), is shown below. displayed formula style equation for poly(propene) formation, or simpler molecular formula style equation below. Poly(propene) is made from propene and is stronger, more rigid and hard wearing than polythene but still flexible. Poly(propene) is also a thermoplastic and can be moulded into many useful objects. Poly(propene) can be drawn out into strong fibres (just like nylon and terylene). Poly(propene) is used for making strong containers like milk crates (a thermoplastic moulding), carpet fibres, thermal underwear and ropes (last three are examples of using poly(propene) fibres. The old name for poly(chloroethene) was polyvinyl chloride, hence the use of the commercial name PVC, and is made from polymerising the monomer chloroethene, CH2=CHCl, (old name vinyl chloride). The equation for the polymerisation of the monomer chloroethene to form poly(chloroethene) is shown in different ways. displayed formula style equation for poly(chloroethene) formation, or simpler molecular formula style equation below. Above is a 'picture' of a section of a very long chain poly(chloroethene) polymer molecule (PVC), essentially consisting of hundreds or thousands of -CH2-CHCl- chloroethene units all joined together. The above diagram is that of a 'ball and stick' type of model and although it looks straight, in reality, the long molecule will be all twisted-jumbled up like in the diagram on the right. The chlorine atoms are shown as a regular arrangement, but they will be more randomly distributed down the ...-C-C-C-... chain depending on which way round the chloroethene molecule added. Poly(chloroethene), another thermoplastic, is much tougher than poly(ethene), very hard wearing with good heat stability, so is used for covering insulation electrical wiring and plugs. Note that most plastics are poor conductors of electricity and so act as good electrical insulation materials. PVC is also replacing metals for use as gas pipes and water drain pipes because it is strong and durable. PVC can be manufactured to be quite rigid or quite flexible depending on its intended use, and, you can vary the composition so that rigidity or flexibility to suit a particular use. More flexible poly(chloroethene) has found a use in the clothing industry e.g. as artificial leather and is readily dyed with bright colours! Rigid PVC is replacing wood for e.g. window frames, metals for guttering and piping because it is tough and hard wearing (durable) with excellent weather proofing properties. PVC can be coloured to suite aesthetic taste and unlike wood, it doesn't rot and it doesn't have to be painted, so saving time as well as money!, but PVC windows are not as aesthetically pleasing as nicely painted wooden windows (I have to say this, because living with persistently rotting windows in an old grade II listed Victorian schoolhouse, I'm not allowed to use PVC windows!). More general points - ways of modifying the properties of a particular polymer-plastic composition. If you increase the chain length of the polymer molecules you increase the intermolecular forces between the chains so it is stronger and less flexible and has a higher softening/melting point. If you shorten the average chain length the polymer has lower softening/melting and is easier to shape, and the plastic is more flexible. If you can reduce the branches in a polymer chain, the molecules can pack closer together (rather like in a fibre), this increases the intermolecular forces giving a more dense, stronger and more crystalline polymer with a higher softening/melting point. Another way of changing the physical properties of a polymer is to add a plasticiser. A plasticiser additive is a relatively large non-volatile molecule (but much smaller than a polymer molecule) that 'pushes' the polymer chain apart a little. This reduces the intermolecular forces, making the plastic more softer, flexible and easier to shape. By this means you can make a rather more 'stretchy' PVC for use as synthetic leather. Plasticisers (e.g. PCBs) are used in PVC to make it more flexible e.g. when it is used for electrical insulation cable. Pollution note: Plasticisers known as PCBs are toxic and can leach out into the environment, and, just like pesticides contaminating water, they can build up in food chains to potentially poison fish and humans, so there use is strictly controlled. Polystyrene's new modern systematic name is poly(phenylethene), a polymer made from polymerising phenylethene monomer (shown below). You can tell that this molecule can theoretically act as a monomer, that is it can be polymerised to a polymer, because it is an alkene with the characteristic C=C carbon-carbon double bond which can partially open up to form linking -C-C-C-C- bonds. Phenylethene (styrene) is like ethene, but one of the hydrogens is replaced with a phenyl group derived from a benzene ring (a -C6H5 group actually, but don't worry about this at GCSE level). A molecular formula equation for the formation of poly(phenylethene), aka polystyrene! Polystyrene is used in a gas expanded form for packaging and insulation - 'polystyrene foam' or 'expanded polystyrene'. This is light and useful for packing breakable objects and valuable items like computers! The trapped air or carbon dioxide? acts as a really good thermal insulator BUT remember, its a very flammable material and there have been tragic accidents when used as ceiling insulation in homes. I hope/presume? this building practice is banned. Expanded polystyrene (EPS), with its trapped gas (from the 'blowing agent' e.g. CO2) gives the material excellent heat insulation properties (thermal insulation material, due to the trapped gas - poor conductor of heat). It can be made into disposable cups for hot drinks like tea, coffee and soup. It can be used as a thermal insulator in other situations BUT bear in mind that it is a highly flammable material and on strong heating gives off flammable gases! PTFE is one of the most hard wearing of commonly used thermoplastics. PTFE is chemically a very unreactive plastic and, unlike poly(ethene) and poly(propene), it doesn't burn easily, so has good flame resistant properties. PTFE with its excellent heat resistance it can with stand quite high temperatures. PTFE's remarkable 'non-stick' properties, combined with its thermal stability and flame resistance has made an excellent coating for 'non-stick' cooking pans. It is the only known surface a gecko can't stick to! tough! PTFE has very low coefficient of friction and can be moulded into moving parts in machines (sliding/rotating surfaces etc.). There are lots of examples! - some described in section 7b. above and more listed below (and described above) are on many GCSE syllabuses. A wide range of polymers are available for use in an even wider range of applications, it seems endless these days from when I was a chemistry student in the 1960s when some of the properties of these new polymers were unthinkable! e.g. electrical conducting, light sensitive etc. Its important to realise that polymer plastics are alternatives to traditional materials like wood and metals and in many cases, if not completely, replacing them on a large scale e.g. water pipes, window frames. There physical properties can range from being very rigid or flexible-stretchy-elastic, very strong, easily moulded if gently heated and pressed (thermoplastic) or set hard after moulding and very heat resistant (thermoset). More notes on comparing thermoplastics and thermosets. Polymers vary considerably in strength e.g. polyamides or nylons are much stronger than poly(ethene) and can even be manufactured to provide a variety of strengths and flexibilities (see example of LDPE and HDPE commercial products of 'polythene'). Many metals have become quite expensive so things made from plastics derived from oil and quite cheap at the moment, but prices will rise as cheap oil gets scarcer. New packaging materials which are light and stretchable. Wound dressings made from hydrogels - polymers that hold water and keep wounds moist. Smart materials (including shape memory polymers) eg 'memory foam' is a polymer that gets softer when it gets warmer so you can make a mattress which adopts your body shape for comfortable sleeping! Elastic fibres that are very stretchable to make tight fitting clothing eg Lycra fibres for tights and sports clothing. Heat resistant polymers are usually thermosets e.g. like melamine resin (plastic plates), but even thermoplastics like poly(propene) can be used in hot situations e.g. plastic electric kettles. Plastics are widely used in the manufacture of cars and other road vehicles because they are cheap to make of varied composition for a wide variety of uses, they are light, durable and can be dyed any colour, they can be flexible or rigid, and so can be used for e.g. used for internal fittings e.g. dashboard cover, floor covers (can be rubber too), door coverings, transparent and coloured covers over headlights and brake lights, and the insulating sheathing for all the electrical wiring. Plastics can be coated with all sorts of materials. 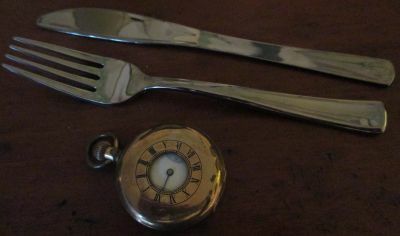 This plastic knife and fork are coated with a material that gives the impression of being a metal and is as bright and shiny as the brass case of the old watch. the difficulty in sorting out polymers in recycling centres so that they can be melted and reformed into a new product. Many polymers are not biodegradable - they don't rot easily!, so they are not broken down by microbes and this can lead to problems with waste disposal - see also section 7c on pollution-environmental problems when disposing of plastic materials. Because of lack of biodegradability by microorganisms, you get environmental problems with landfill sites and street litter and it may take years before the plastic materials break down - ie decompose! Most plastic don't rot away because synthetic polymers are chemically very molecules and most microorganisms don't have the enzymes to break up the bonds of the polymer chain and break the plastic down. This is fortunate enough when we want to use plastics, but not so good when we want to dispose of waste plastics! There is also a growing problem with vast quantities of plastic debris circulating around our seas and oceans. You can bury waste plastics in landfill sites BUT even after many years most plastics will not have rotted. Burning waste plastics produces all sorts of polluting gases like hydrogen chloride, hydrogen cyanide and sulfur dioxide, incineration seems a good idea, but would you like to live down-wind of the combustion plant! However, all is not lost and chemistry and technology can come to the 'rescue' and lots of new improved polymers for existing applications as well as new polymers for new applications are constantly being developed. eg plastic bags are being made from polymers derived from cornstarch making biodegradable plastics that break down more easily via microorganisms in the environment. AND, wherever possible, recycle and reuse! (see section below). 'Non-rotting' litter around the environment. Even our lakes, seas and oceans are carrying waste plastic materials causing harmful effects on wildlife. Can we burn waste plastic? When plastic materials burn they can produce highly toxic gases such as carbon monoxide, hydrogen cyanide and hydrogen chloride (particularly from PVC and other plastics containing chlorine and nitrogen). The toxic fumes cause deaths in house fires and controversial problems with alleged inefficient waste incinerators as they will definitely cause environmental problems if burned on waste tips! How can we recycle plastics? What ways are used to recycle plastics? Less environmental impact i.e. less unsightly pollution, reduction of volume of waste in land-fill sites. It conserves valuable oil based resources, especially as oil is becoming increasingly expensive. It is difficult to recycle plastics because of separation into the different types of plastics and their different physical properties. BUT this should not prevent us from trying and it would be beneficial to prolong the life of the finite crude oil reserves AND reduce pollution and space in land-fill sites. There are problems in trying to sort out the different plastics into useful categories, they are not easy separate, you can't just use any old mixture of polymers. At the moment, a lot may have to be sorted by hand - lack of automation makes the sorting more costly. You also have the cost of collecting domestic rubbish or industrial waste, transporting it and sorting it all out, all of which costs money. However, people are coming up with ideas. A company in Scarborough, England, is collecting waste plastic. This is shredded and compressed into porous pads and used for good 'underground' drainage layers for footpaths, golf greens and sand bunkers etc. and has a good working life because the material isn't biodegradable! Clear soft drink bottles are made from PET (polyethene/polyethylene terephthalate) which can be recycled as fibre-fill for pillows and carpets. This save 90% of the energy costs compared to the original manufacturing process. Energy costs are a big economic recycling factor, its not just about making naturally occurring resources like oil last longer. However, it takes about 20,000 drinks bottles to make a tonne of recycled PET. New plastics are being developed which are more biodegradable or can be recycled, so will the paper bag and cardboard package make a comeback? (in Ireland you have to bring your own bag or buy one, and not necessarily a plastic one! ), this isn't a recycling process BUT it does reduce environmental pollution. You can mix starch granules (very biodegradable) with plastics like poly(ethene) which enables microorganisms to grow and feed on/in the plastic and eventually help biodegrade the plastic itself. By breaking down the starch the microorganisms also break down the poly(ethene). You can also manufacture plastics whose break down is initiated by exposure to sunlight. This is particularly useful in agriculture where plastic bags of fertiliser are in common use. In 1988 Australia issued bank notes made from recycled poly(propene). These plastic notes apparently have the advantage of being more difficult to forge and they last longer! Other ideas include making more durable plastic bags that can be used many times for shopping. Ideally some recycled thermoplastics and scrap material from a plastic product manufacturing process, can be heated and remoulded in the same process or another product. It is possible in some cases to break the plastic material down with heat (a sort of 'cracking') into smaller organic hydrocarbon molecules that can act as chemical feedstock like those from oil itself, from which you can make other valuable products including plastics. Less green, but useful purpose, is to use scrap plastic as a fuel, but complete incineration is not always easy to be efficient and clean burning. All of these will slow down the rate at which valuable oil-petroleum deposits are depleted - the latter are finite, so we should make the best use of them. See also Pollution due to carbon monoxide etc. So, below is a decision making exercise on choosing a plastic for a particular job! Note: NOT ALL the properties are necessarily relevant to make the decision. At the moment A to F match questions (a) to (f) once only, but I may add further questions! This exercise should provide a good challenge and discussion for a class, any feedback comments appreciated. Polymer product Production cost Chemical resistance Melting point Strength (rigidity) Transparency can be made into fibres? (a) Which plastic could be used as for disposable tableware like plates for hot meals or coffee cups? (b) Which plastic could be used as a moving plastic component in a machine? (c) Which plastic could used as containers for high volume production line of acids or alkalis? (e) Which plastic is suitable for clothing fabrics? (f) Which plastic would be used for super-market carrier bags? See also section 11. for other types e.g. condensation polymers, thermosets etc. (a) Plastic B, to be disposable it must be cheap, chemical resistance doesn't matter (only in contact with food/drinks once), needs to be heat resistant, transparency doesn't matter?, needs to be reasonably rigid. (b) Plastic E, firstly, it must be very strong to withstand the physical movement and friction in a working machine, it withstand heat from friction, chemical resistance need not be high, high cost acceptable for a specialised non-disposable part of a machine. (c) Plastic F, needs to be reasonably cheap but heat and chemical resistant. (d) Plastic A, it needs to be transparent to read the calibration marks accurately, it needs to be chemically and heat resistant to safe to use in the laboratory, it needs to be rigid to retain its accuracy, the high cost would be acceptable for a valuable measuring instrument in the laboratory, its not disposable. (e) Plastic C, most important that it can be made into fibres, chemical and heat resistance is the responsibility of the owner/wearer!, needs to opaque or it becomes a 'see through'! (f) Plastic D, the plastic needs to cheap, flexible and disposable (low cost), heat and chemical resistance are not important - responsibility of user! Notes information to help revise KS4 Science Additional Science Triple Award Separate Sciences Chemistry revision notes for GCSE/IGCSE/O level Chemistry Revision-Information Study Notes for revising AQA GCSE Science AQA GCSE Chemistry, Edexcel GCSE Science, Edexcel GCSE Chemistry, OCR 21st Century Science Chemistry, OCR Gateway Science chemistry, WJEC/CBAC GCSE science-chemistry CCEA/CEA GCSE science-chemistry (and courses equal to US grades 8, 9, 10) KS4 Science properties structure uses addition polymers properties uses of plastics poly(ethene) poly(propene) PVC polystyrene PTFE pollution disposal GCSE chemistry guide notes on properties structure uses addition polymers properties uses of plastics poly(ethene) poly(propene) PVC polystyrene PTFE pollution disposal for schools colleges academies science course tutors images pictures diagrams of apparatus for properties structure uses addition polymers properties uses of plastics poly(ethene) poly(propene) PVC polystyrene PTFE pollution disposal investigations word balanced symbol equations of properties structure uses addition polymers properties uses of plastics poly(ethene) poly(propene) PVC polystyrene PTFE pollution disposal science chemistry revision notes on properties structure uses addition polymers properties uses of plastics poly(ethene) poly(propene) PVC polystyrene PTFE pollution disposal revising the chemistry of properties structure uses addition polymers properties uses of plastics poly(ethene) poly(propene) PVC polystyrene PTFE pollution disposal help in chemical understanding of properties structure uses addition polymers properties uses of plastics poly(ethene) poly(propene) PVC polystyrene PTFE pollution disposal description of properties structure uses addition polymers properties uses of plastics poly(ethene) poly(propene) PVC polystyrene PTFE pollution disposal experiments for chemistry courses university courses in chemistry careers in chemistry jobs in the chemical industry laboratory assistant apprenticeships in chemistry technical internship in chemistry IGCSE chemistry properties structure uses addition polymers properties uses of plastics poly(ethene) poly(propene) PVC polystyrene PTFE pollution disposal USA US grade 8 grade 9 grade10 properties structure uses addition polymers properties uses of plastics poly(ethene) poly(propene) PVC polystyrene PTFE pollution disposal chemistry what is HD HDPE poly(ethene)? what is LD LDPE poly(ethene)? what is the difference between HDPE and LDPE? what are the reaction conditions to make LDPE and HDPE poly(ethene)? how do you make addition polymers? what is the structure of addition polymers? what do we use addition polymers for? what is the effect of heating poly(ethene)? diagram of poly(ethene) molecules, diagram of structure of PVC, what is PTFE plastic? how can you dispose of plastic polymers? how can you recycle plastics? what can you reuse plastics for?